I was fortunate enough last weekend to receive an invitation to the Sydney Catholic Schools Early Years Conference. I was interested because the conference was centred around creating a clear and coherent vision around Early Years pedagogy. I was also intrigued to see how the iPad fitted in with this vision. One of the sessions I attended was Technology in the Early Years - Apps and iPads by Kate Highfield a Lecturer in Early Childhood from Macquarie University Sydney. Kate was certainly an engaging and passionate speaker but what really impressed participants was a scaffold by which we could evaluate the apps that are used within the confines of our own classrooms. Kate and her research partner Kristy Goodwin have developed this scaffold from their research into educational apps. Kate suggested that we could plot apps on a educational continuum depending on where the different apps contribute to cognitive development. Three main categories along this continuum were identified; Instructive, Manipulable, Constructive. The first type of apps that were identified (Instructive) were those apps that were drill and practice. We have all used these types of apps, we start off quickly and are drawn into the gaming qualities of colourful visuals, a quick pace and repetitive music. These games can be fun but they have minimal cognitive investment from the student. They generally play them for 6 or 7 minutes and then move on to another game. These apps are useful for some students and for certain tasks. The second category (Manipulable) are those apps that allow multiple responses to the app. Different responses can be made but really only from a specific set of variables. These apps are good but they require very little development of higher order thinking skills. These apps tend to be addictive because of the instant feedback and continued gratification. These apps have only minimal long term cognitive value. The category that Kate was most excited about was the last. These Constructive style apps allow a students to synthesis a learning object from scratch or build it freely from a range of available components. 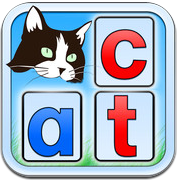 These types of apps create a high level of both cognitive involvement and cognitive development. Kate suggested that these apps actually have very limited extrinsic rewards and so the students are motivated not by feedback but rather by the challenge set by the app. These apps often have an open ended component to the structure of the activity and it is this open-endedness that allows for the deep cognitive development within task. So when we look at the app store, what type of apps are we going to offer our students? What type of learning do to we aim to create with the use of technology? Can we actually provide deep cognitive development that is both differentiated and easily achievable? What apps fall into this Constructive category? Kate provided a series of suggested apps. This is obviously not an exhaustive list but rather a series of suggested apps that allow student to make a substantial investment in the process of their own learning. Drawing Pad offers an incredible amount of fun and creativity. 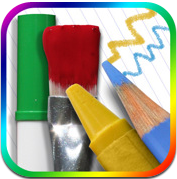 Drawing Pad lets you create drawings from a blank canvas or use the background library and accompanying objects. Let your students create scenes for storytelling or embellishing narratives. 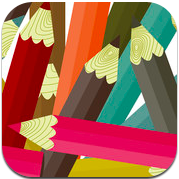 Drawing Pad is an "Apple Staff Favorite" and was featured in the "Spotlight" of the App Store. 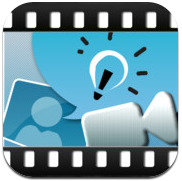 Create your own animated stories. 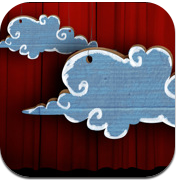 Simply pick out the characters, drag them onstage and tap record. Movements and audio is recorded for your performance. If you get the Directors Pass you can act out a story of Pirates on the high seas, fight scary monsters or play the part of a wild west bandit. 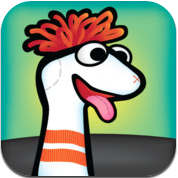 Sock Puppets lets you add Puppets, props, scenery, and backgrounds and start creating. Hit the record button and the puppets automatically lip-synch to your voice. Switch backgrounds to take your puppets to different places, move the puppets, props and scenery to animate them while recording. Cartoon and photo realistic puppets are included. 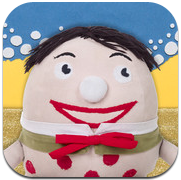 The Play School Art Maker app is a fun way for kids to create pictures, animated movies and story slideshows using the Play School toys and craft items. They can even add their own audio narration, upload their own photos as backgrounds, and save photos of their art. Play School Art Maker encourages imagination and creativity through open play. 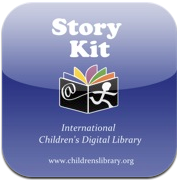 Create an electronic storybook. Write some text, illustrate by drawing on the screen, tag a photograph or drawing on paper and then photograph the image. Sounds can be recorded for narration or effects and the layout elements of your story can be dragged, pinch and altered with ease. This a great app for students to create books of their own narratives. Explain Everything is an easy-to-use tool that lets you annotate, animate, and narrate explanations. You can create interactive lessons, activities, assessments, and tutorials using Explain Everything's flexible and integrated design. Use Explain Everything as an interactive whiteboard or nsert a web browser for live annotations and basic recordings. The simple way to create your own beautiful books right on the iPad. Read them in iBooks, send them to your friends or submit them as assignments. Ideal for students projects, picture books, art books, cook books, manuals, textbooks and the list go on. This is a great way for students to become content creators. Thank you! This is a great resource. Hi, Greg - this really is a great resource! I hope you will join our #ECETechChat on Twitter. We host it on east coast of USA so for us it is 9:00 PM eastern time. We'll all enjoy learning more about your work and sharing your site! Fanatstic! great resources. just what Ive been looking for! Well, that's what I was looking for. Am all for I-pad for education. Thanks gor the resource Reg! I love the idea of teh spectrum for iPad Apps. It articulates challenges we have been having in our setting for quite and the difficulty in finding high quality 'constructive' Apps on the market. The examples you have given really help! Big Steps in early childhood education and care (ECEC) is a campaign to transform the ECEC profession into what it should be – stable, respected and well paid. We are campaigning to win professional wages for ECEC professionals. For too long, the crisis in ECEC has been on the increase. Educators are leaving the profession in droves for jobs with less responsibility and more pay. And who would blame them? A qualified ECEC professional earns around $18 an hour to educate and care for our greatest resource. A campaign by members of United Voice, the ECEC union, Big Steps is working hard to halt this growing crisis. Professional wages would transform ECEC, stem turnover and encourage a quality ECEC sector focussed on giving children the best start in life. Amazing.I think that are the best tip way to develop an apps..Thanks for sharing!! I loved the graph of the educational continuum plot apps on where the different apps contribute to cognitive development. Is there research on the use of Apps to develop English as a second language? I am a bilingual teacher. I would like to know how to select apps in order to support English language development as a second language. It would be great to see some of those Apps on a educational continuum plot. Awesome links shared on this page. I am glad that I came across this one.